Rooms from $82.51 per night. Description This Alpharetta, Georgia hotel has an indoor pool, free internet access, non-smoking guest rooms and free breakfast. A heated indoor pool complimentary breakfast buffet and free Wi-Fi welcome guests to Holiday Inn Express Alpharetta - Roswell. 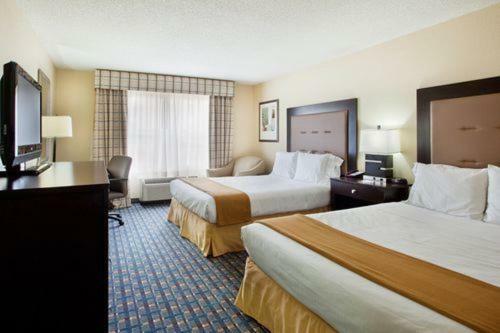 The Holiday Inn Express Alpharetta - Roswell has 70 rooms and 10 suites on three floors with triple-sheeted bedding free Wi-Fi microwaves mini-fridges coffeemakers and work desks. Non-smoking rooms are available. Enjoy the complimentary breakfast buffet keep healthy with a visit to the fitness center and take a dip in the heated indoor pool or whirlpool. Parking is free and airport shuttle service is available for a fee. The hotel is in the business corridor of Georgia Highway 400. For business travelers it's two miles to IBM 12 miles to Siemens four miles to AIG and six miles to Compaq. Leisure travelers can drive to Georgia Aquarium or World of Coca-Cola both 22 miles. Shoppers can go two miles to North Point Mall and 24 miles to Underground Atlanta downtown. Hartsfield-Jackson Atlanta International Airport is 28 miles away. 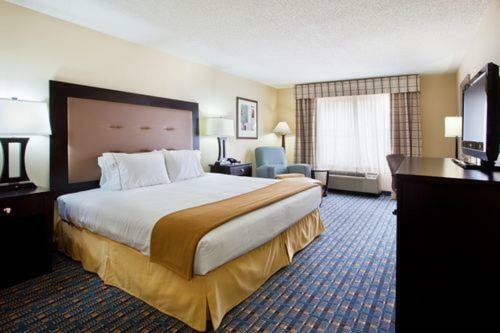 Add Holiday Inn Express Alpharetta - Roswell to your free online travel itinerary.